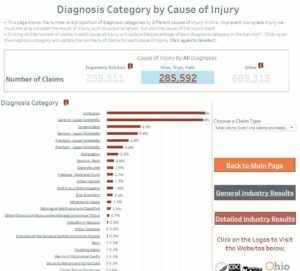 The CDC’s National Institute for Occupational Safety and Health and our own state’s Ohio Bureau of Worker’s Compensation joined forces to develop some really cool interactive charts. They show worker injury trends in Ohio over a 10-year span. It’s no surprise that the Diagnosis by Cause chart has Slips, Trips, and Falls in a category all by itself. Click on the Number of Claims (285,592!) to see the resulting diagnoses.